Why I Love Saint Seiya So Much Part-I: The Soundtrack. We are merely 4 weeks to the great finale of the Anime of Saint Seiya- Soul of Gold-! , and in commemoration for that I will put a 4 part article on why I this is one of my favorites Anime/Manga franchises and why you should Give it a look. So Let´s start! Saint Seiya is a Manga made by Masami Kurumada in the year of 1986. From the Genre Shonen series, which tells the story of Athena, the Greek Goddess of War, and how when the world is about to face it´s greatest dangers, she will come in their aid, but she will not be alone because her army, the Saints will be there. The Saints. Warriors who fight with their fist and feet. They wear armors that represent the constellations, it is say that the can break the sky with the fist and crack the earth wit their kicks. They do this thanks to their ability to explode the Cosmos inside their body, an energy that we all have, Like a Big Bang. 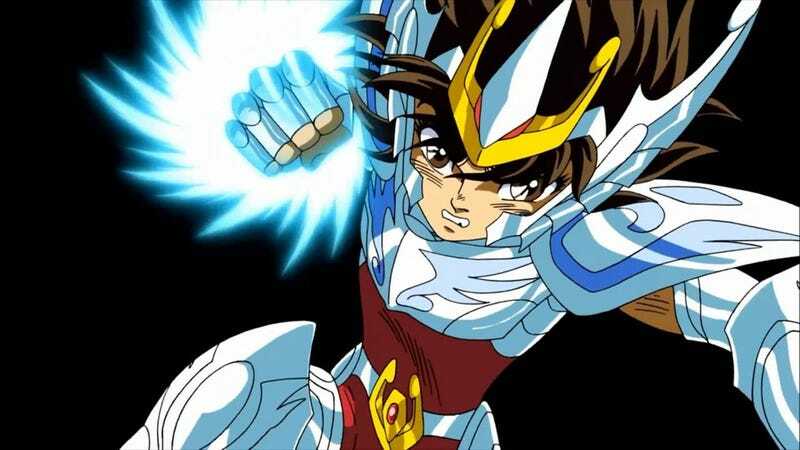 This story centers on Seiya, the Bronze Pegasus Saint, and his friends: Dragon Shiryu, Andromeda Shun, Swan Hyoga and Phoenix Ikki. And how all of them will have to face lot´s of dangers and even the own Sanctuary itself, in order to protect the Goddess! Some series have truly good soundtracks, even memorable ones! But in the case of Saint Seiya, the soundtrack is such a big master piece that it doesn´t age with the flow of the years…But on the contrary, it gets even better, like a good wine. And in some ways, I wouldn´t be surprised if one day in the future is considered a classical masterpiece. It´s music that truly gets into you and make you, even if you have never watched or read something of Saint Seiya, to know what is happening, even if you don´t know the places or names, you know that something dangerous is in there, that there is love, that there is sad, joy, , constant danger and peace! I Could keep up all day showing you soundtracks of this, but I think I made my point clear in that regard. And of course, you could say that is only true for the original Series and it´s Ovas/Movies. Anyway, that is the soundtrack of this amazing franchise!. See you next week with the part two!. AniTay, have you felt the Cosmos?